In my two blog posts last week, I shared My Story of divorce and the pain and challenges I've lived through over the last two years as a result. 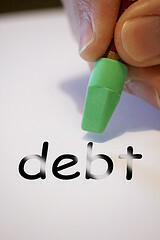 I've also shared my family's debt free story in this blog on a few occasions. During our marriage, my wife was mostly in agreement with me on finances. We were able to work together on setting up a baby emergency fund, sell our house, move into a rental home, and then pay off over $25,000 in debt in about 18-19 months. Once that debt was finally paid off, though, we couldn't seem to move beyond those steps into long-term wise financial management. While I would say my ex-wife was about 90% in agreement on our finances, that final 10% caused a number of problems on a variety of different levels. Our money fights did not stem from large bills that couldn't be paid. Rather, our struggles revolved around a sense of agreeing on moderate financial sacrifice in order to continue moving down the list of the 7 baby steps. Whether people like it or not, money and marriage are a HUGE deal. I'm sure you've heard the statistic that money is the Number One reason for divorce in North America. I would contend that money is not necessarily the reason for divorce. I view money problems in marriage as a SYMPTOM of bigger problems. In my own marriage, money was a major symptom of other issues. The greater issues in my own opinion were control, maturity (or lack thereof), teamwork, forward thinking and planning, and finally a matter of honoring God through our family finances. If you are truly a child of the King and acknowledge the Lordship of Jesus Christ in your life, then at some point you need to surrender the family's finances over to Him. You need to allow Him to guide and direct the money He has entrusted to you through the financial principles contained in His Word. Honestly, as a single father, I have had an easier time managing my finances outside of the marriage then I did within it. I am a geek. I am disciplined. I am good at budgeting. I am generally low maintenance and require very little in the area of materialistic desires. Once our separation and divorce process was underway, I had resolved with God's help that I would remain debt free. I wanted to be able to cashflow the divorce so that I wouldn't need to go back into debt. I had a great starting point. Since we became debt free in the middle of the marriage and no longer owned a home together, I was in an awesome place to continue my debt free journey. I acknowledge that my situation is/was extremely unique and not everyone walking through a divorce has the same incredible beginning point that I had. I definitely used this to my advantage while I moved forward in my personal finances. I prayed for God to honor my financial stewardship. Many times in my morning quiet time, I would lay out before the Lord my major expenses related to the divorce process, whether it be making child support payments, attorney fees, and so on. I began this time of prayer acknowledging that the money I did have wasn't even mine to begin with. It's His money! I also reminded the Lord of my track record of generous giving and financial stewardship. I had worked very hard to become debt free and to lay a good financial foundation for the future, and I didn't want that taken away from me because of poor choices from my ex-wife. I increased my giving back to God. I realize that this seems totally counter-intuitive, but through increasing my giving back to God through the ministries of my church, I acknowledged that God was in control of the entire situation. In His economy, He could provide the necessary financial resources that would allow me to stay debt free. I continued to work my financial plan. The Financial Peace principles as taught by Dave Ramsey really do work. If you follow the plan and consistently stay the course, then you will be successful over time. I sought and received excellent legal counsel. I was fortunate to have an attorney friend who saved me a few thousand dollars at the beginning of the process through helping me file necessary court paperwork pro se. Once I got past the first pre-trial court hearing, though, my attorney friend handed me over to a great attorney who was less expensive than a lot of other attorneys. Never underestimate or take for granted the power of your personal network of friends! I allowed the entire process to go to trial. I'll be honest, I did try to negotiate a deal a few weeks before our final trial date, but I never liked the deal that was being forced upon me by the other party. So, I allowed the entire situation to be heard by a family court judge. For the most part, I was pleased with his final ruling. I saved myself tens of thousands of dollars over the next 12-15 years by taking this route. I walked in an attitude of gratitude. From day one of my marriage problems, I did not want a divorce. I kicked and screamed my way through the entire process. I ended up having to spend thousands of dollars to protect the interests of myself and those of my daughters that frankly I would have rather seen spent on God's Kingdom work. I had to tighten down pretty hard on my budget in order to cashflow all of my divorce-related expenses. Even though I went through an 18-month process of feeling a slight sense of lack and financial strain, I still praised and thanked the Lord for who He is and what He has blessed me with. I tried to live my crazy, broken life with an attitude of thanksgiving, because I knew that compared to a lot of other men and women walking through divorce, I was doing pretty well. I was going to come out on the other side of this messy life in relatively decent financial shape. God has been good to me, and I praise and thank Him for His goodness!